Squirrels are rodents. They live mainly in trees, but they frequently come down to the ground in search of fallen nuts. 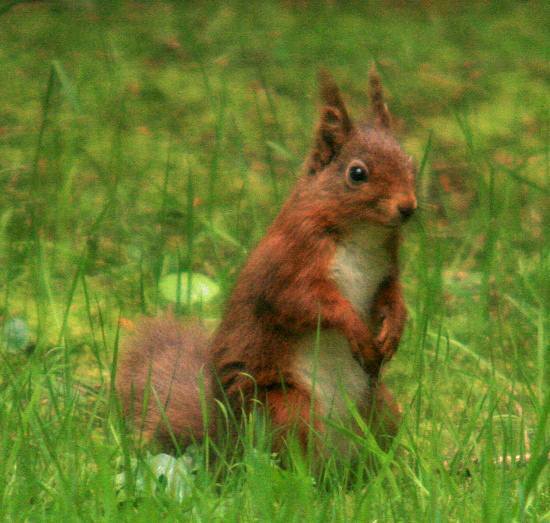 throughout much of Scotland and parts of northern England there are still plenty of red squirrels. 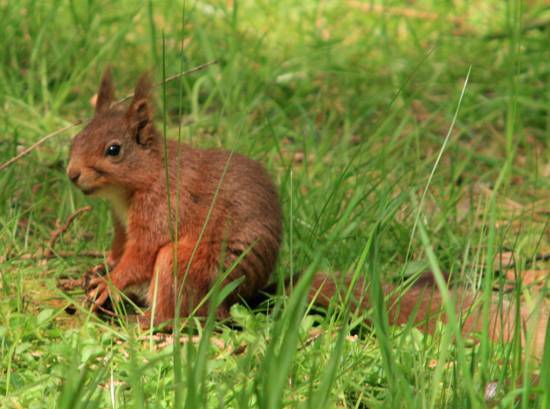 In Wales you may occasionally see red squirrels in Newborough Forest, on Anglesey, and in Brechfa Forest, near Llyn Brianne Reservoir in Carmarthenshire. In southern England the Solent acts as a barrier, preventing grey squirrels from reaching the Isle of Wight; as a result only red squirrels can be found there. Grey squirrels are now far more plentiful than red squirrels - indeed, since their introduction from North America, grey squirrels (Sciurus carolinensis) have replaced red squirrels in many parts of Britain. Fortunately there are still a few strongholds of red squirrels in the UK, while in Ireland they are quite common, with Killarney National Park a particularly good pace to see them at close quarters. Grey squirrels have an unfortunate tendency to damage trees by stripping them of their bark. Once the bark has been removed all the way round a tree, it must die. Squirrels also help to propagate trees as they bury caches of nuts underground. Whenever they fail to recover these stores, some of the nuts may germinate and then new trees can arise. A squirrel's nest, which is usually in a tree, is called a drey; it is where the young squirrels are looked after for the first two months of their lives. Squirrels breed in late winter or early spring. A typical litter would be between three and five youngsters, which are known as 'kittens'. In years when food is plentiful there may be two litters per year, although most are destined to die in their first year of life (and road kills are a major cause); however, if it survives its first year and learns about life's many hazards, a red squirrel can live for up to six years.